Where ends the virtue or begins the vice." It seems a bit odd to speak of a player barely 23 years old as a “veteran,” but the Washington Capitals’ Tom Wilson just about qualifies. Drafted 16th overall in 2012, and perhaps forever to be known as “the other first round draft pick” in the draft that yielded Filip Forsberg, Wilson has appeared in more games than anyone in his draft class (313) than any of the 211 players taken in his draft class except Montreal’s Alex Galchenyuk (336). He finished the 2016-2017 season in 58th place all time in games played for the Caps, ahead of such better known personalities as Joe Juneau (312), Tomas Fleischmann (283), and Al Iafrate (256). Wilson appeared in 82 games in 2016-2017, the third time in four seasons he completed the entire dance card of an NHL regular season. This year, though, there was less “dancing.” Coming into this season, Wilson racked up more penalty minutes over the last three seasons (486) than any player in the league. Only two players – Cody McLeod (45) and Derek Dorsett (38) – were charged with more major penalties than Wilson (36). Wilson was still among the leaders in penalty minutes in 2016-2017, but his 133 minutes were 30 fewer than in 2015-2016 and the lowest of his four-year career. 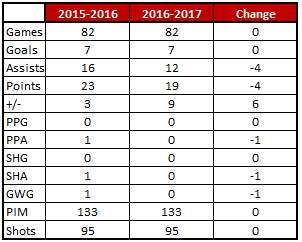 It might have been an even more abrupt reduction in penalty minutes but for a rather active end of the season. Wilson started the season in an almost placid fashion, accumulating only 35 minutes in his first 30 games. Even through six ten-game splits he had just 65 minutes, putting him on a pace to finish with 89 minutes. However, he had 68 minutes in his last 22 games (more than half of them – 35 – coming in three games). One might have thought that this season of reform with respect to playing within the rules was accompanied by an improvement in the finer arts of the sport – goals, assists, points. Given that Wilson improved in each scoring category in each of his first three seasons, this seemed a reasonable expectation. Unfortunately, Wilson’s low penalty totals early in the season were accompanied by low offensive output. He was just 2-2-4 through his first four ten-game splits. The good news is that Wilson did pick up his production pace over the last half of the season. In his last four ten-game splits he was 5-10-15, a 10-21-31 scoring pace over a full 82-game season. It was a case, in part, of picking up his shooting pace. After recording just two goals on 38 shots in the first four ten-game splits (5.3 percent), he had five goals on 57 shots in the last four ten-game splits of the season (8.8 percent). It allowed Wilson to finish the year with a career-best 7.4 percent shooting. Fearless’ Take… One area in which Tom Wilson has been given more responsibility is penalty killing. In his first two seasons he logged a total of eight seconds of penalty killing time. In 2015-2016 he was upped to an average of 1:35 per game, and this past season he was one of for forwards to top two minutes per game in penalty killing (2:04). And there was that next level scoring. The Caps were 14-3-0 in games in which Wilson recorded a point. And he was a player for whom more time was an indicator of more success (another example, perhaps, of being able to roll four lines). Washington was 10-3-0 in those games in which he logged at least 15 minutes, only 5-5-3 in those games in which he logged fewer than 11 minutes. Cheerless’ Take… One might have thought the last thing to come around in Tom Wilson’s game would be his ability to find the back of the net. He came into the league as a raw talent and spent his first three years as the closest thing to an enforcer as there is left in the NHL. But now, after four seasons, Wilson is in a difficult spot. There have been 20 forwards in Caps history 23 years of age or younger who appeared in at least 100 games and recorded at least 50 shots on goal while appearing in four seasons. Wilson is last on that list in goals per game (0.07) and in shooting percentage (6.3 percent; numbers from hockey-reference.com). Wilson is unlikely to become a high-end producer on offense, but one might reasonably expect that his numbers need to improve. Odd Wilson Fact… The Caps were 34-13-3 in games in which Wilson did not serve a penalty minute, 1.42 standing points per game. They were 21-6-5 in those games in which Wilson did serve time in the box, 1.47 points per game. They were 6-2-2 in games in which he was charged with at least five minutes (1.40 points per game). It hardly seemed to matter. The Chicago Blackhawks are a talented, successful team. One way we know this is that since 2005-2006 only two Washington Capitals recorded three or more points against them – Nicklas Backstrom in March 2010 (2-1-3) and Mikhail Grabovski in October 2013 (3-1-4). Last January, Tom Wilson became the third such Capital to record that achievement. Wilson got on the score sheet when he recorded an odd assist on a jay Beagle goal six minutes into the game. Taking a pass from Daniel Winnik at his own blue line, John Carlson headed up ice and tried to split the defense at the Chicago line. He blew a tire, though and the puck slid toward the left wing boards where Michal Rozsival tried to clear it. Wilson got his stick on it, though, and it bounced to Winnik, who fed Beagle for a wrister at the top of the left wing circle that skittered through goalie Corey Crawford. The Caps added two more goals in the first period, and then Wilson got a goal of his own late in the second period. Exiting the defensive zone with speed, Lars Eller banked a pass off the right wing boards to Nate Schmidt closing on the Chicago line. Putting on the brakes, Schmidt fed the puck in deep to Wilson darting to the net. Even though the pass was muffled by Brian Campbell, the puck had enough juice to get to Wilson, who swatted it past Crawford with just over two minutes left in the period. After T.J. Oshie scored early in the third period to make it 5-0, Wilson got his third point when he assisted on Beagtle’s second goal of the game with less than two minutes left in the 6-0 win. It was Wilson’s first three-point game in the NHL. Playing for your hometown team is a thrill, and one supposes that if you don’t have that honor, playing against them might be the next best thing. Unless you have the sort of game Tom Wilson and the Caps had in Toronto in late November. The Caps won the before and after games on home ice around the Thanksgiving holiday, and the trip to Toronto completed a back-to-back set of games, their third game in four nights with a holiday thrown in for good measure. Not a recipe for success. The Leafs scored less than three minutes into the game, scored again less than four minutes into the second period, and then scored again less than a minute into the third period. The Caps sandwiched a couple of cosmetic goals around a fourth Toronto goal, and the Caps dropped a 4-2 decision. Wilson’s contribution was a fight against Matt Martin in the third period, after which he had just one shift on a night when he skated less than nine minutes and a team-low 15 shifts. Three goals from a fourth-liner in 13 postseason games is not a bad performance, but appearances can be deceiving. Wilson scored all three of those goals in the first four games of the opening round series against Toronto. The first one came in Game 1, the overtime winner on his only shot of the game, and it was his first career playoff goal. 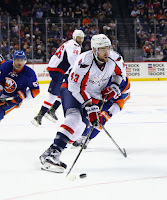 The other two came in Game 4, both of them scored when he was put on the third line with Lars Eller and Andre Burakovsky, each assisting on one of Wilson’s goals. But that was it. Wilson went the final nine games of the postseason without a point and 12 shots on goal. And he logged penalty minutes in five of the last six games of the series against the Penguins, 22 minutes in all. Tom Wilson might have taken a step sideways in his development in 2016-2017. He did not take that step forward in offensive production, although he did take on additional defensive responsibilities (more penalty killing time) and pared back his penalty minutes (the late stages of the postseason being the notable exception). Wilson is certainly young enough that the bump in offensive production one would hope for a 16th overall draft pick can still be realized, but he has enough games under his belt that he might no longer be considered all that young. With departures in the offing from this year’s club, a performance in 2017-2018 by Wilson along this year’s lines could be considered a disappointment. But for now, he’s still working out the difference between where ends the vice of being the “physical” player and where begins the virtue of being a more frequent contributor in other ways.